In recent years it has become widely accepted that eCommerce businesses that are not mindful of mobile eCommerce best practices will be left in the dust, and stand to lose billions. Astute mobile UX designers know it’s essential to make sure all eCommerce experiences are designed for mobile. The phenomenal growth of eCommerce has fueled the advance of mobile eCommerce and the numbers paint a vivid picture. eMarketer expects global mCommerce sales to reach $3.5 trillion by 2021, and account for 72.9% of the eCommerce market. What’s fueling this remarkable growth? Significantly more users are accessing the web from a mobile device rather than a desktop, and they are doing it with more eCommerce intent than ever before. They are there to shop and ready to buy. Mobile eCommerce however, has special requirements for great UX. Shoppers expect an eCommerce site or app to work well on mobile—it not only has to look beautiful, but it should also have seamless UX and adapt to their behaviors. There are many aspects to keep in mind for conversion-oriented mobile eCommerce design. Typically, mobile eCommerce best practices use mobile UX design best practices as a baseline, and savvy mobile UX designers take it to the next level. Mobile eCommerce trends show that the mobile eCommerce market is growing exponentially and the expansion of the industry has created a multitude of benefits for sellers. However, with this comes a slew of best practices and standards for mobile eCommerce UX design that businesses must follow if they are to be successful. Although every eCommerce store is different having its own limitations and goals, following the mobile eCommerce best practices outlined in the infographic below will help create a more successful mobile eCommerce experience. What is a mobile user experience? Mobile user experience refers to how a person feels and thinks when using a mobile site or app. Mobile user experience design is less concerned with the look and feel of a product, and more concerned with how it makes users feel. Mobile user experience is focused on the user rather than the aesthetics. How long should it take for a page to load? 53% of mobile visitor will leave if page load time is longer than 3 seconds. Mobile eCommerce best practices call for a maximum of 2-3 seconds of load time. On desktops, the load time may take a little longer and it will still be acceptable. What are gestures on mobile? People interact with a mobile device by performing gestures on the touchscreen. Every app, game or tool on a mobile device typically includes the ability to swipe, tap or pinch to function—called gestures. Mobile gestures are the movements made by a user to activate and use a specific control within a mobile UI. The average documented online shopping cart abandonment rate for eCommerce is 69%. Seamless UX design can reduce cart abandonment greatly. The best-optimized checkout process has a cart abandonment rate of 20%. How do fingerprint scanners work on phones? Smartphone fingerprint scanners come in many different shapes and sizes. 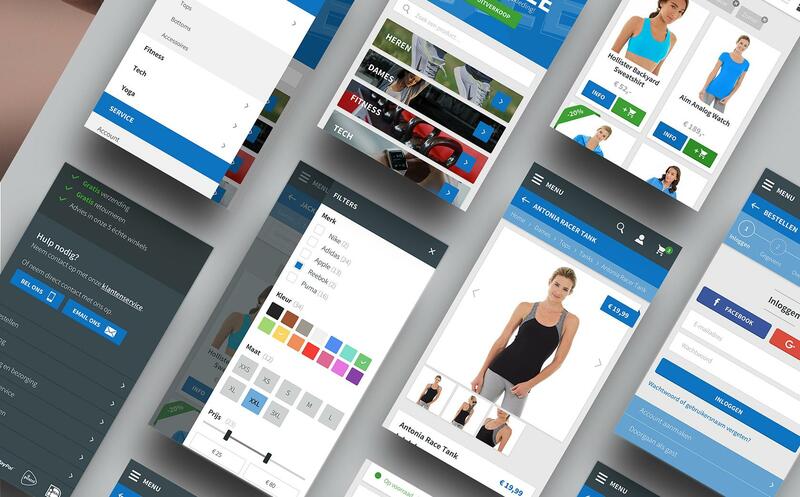 They’re important to utilize for eCommerce mobile app design. Similar to optical scanners, they generate an image of the ridges and valleys of a fingerprint, but instead of using light, the capacitors use electrical current. Love the infographics, great info. Thank you for sharing.